This Friday, the Metropolitan Transportation Commission's (MTC) Operations Committee will be having their public meeting. On agenda item #6, it is updates from the Executive Director of the MTC about TransLink to Clipper transition. Don't expect that new customer service center to be open anytime soon. It's now been pushed to the Fall because they are seeking a bigger space, and will be using Embarcadero BART as their San Francisco service office. They are also considering to open one in the East Bay. As all of you know, Clipper is official starting on June 16th, and all the vendors such as Walgreens will be able to issue people a brand new blue color Clipper card. 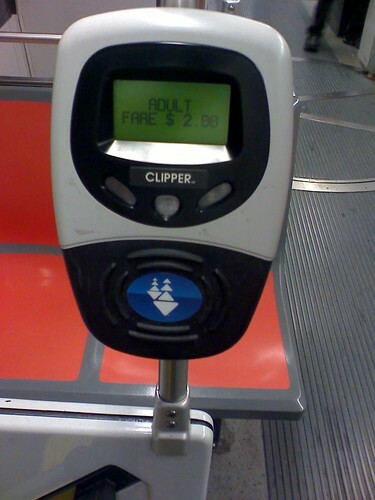 For the first three months, the Clipper card will be FREE, instead of paying the $5 initial fee to obtain it. The Executive Director states: "For customers who already have a TransLink card but want to have a Clipper card, they can simply use any remaining balance on their TransLink card, acquire a Clipper card at no charge, and the begin using the Clipper card..."
For those who use Autoload, you would need to contact the customer service office in obtaining the new Clipper card. Hmmm... I'm not liking what he just said. I don't use Autoload and I have a decent e-cash balance on my card. I won't be able to fry all the cash value in the TransLink card for a good while (I have a paper Muni pass), and by the time I deplete my account, the Clipper card fee will return to $5. Plus, doesn't the MTC want some good P.R. by letting one of their most loyal customers since the start of the TransLink pilot program in 2002 (that's me! ), to be one of the FIRST to use the brand new card? Hey, um... where's my invite to the press conference next Wednesday? Are you going to have one? Although I'll fully believe it only if it actually happens, I've been repeatedly assured that my TL card (which happens to be autoload) WILL work once the Clipper transition happens. That's maybe not your point here, but in case readers don't know that. There's no *real* reason for TL cardholders to get a Clipper card. Or so they're saying. That is true, the old card will still work fine. The point of my article is that for those who want the new card and wants to say goodbye to the old one will have to eat-up the card's value first; there's no transferring of funds. Anyway, the new cards are supposed to be more responsive when placed next to the sensor. For those who argue the old card is slow, the new card will be a glimmer of light. CLIPPER card does have a better faster chip. So there may not be a *real* reason to switch from your Translink card unless you don't want a slow card at the faregates. Can't one get the new card while they're still free, use up what's left on the old one, and then switch over to the new card?